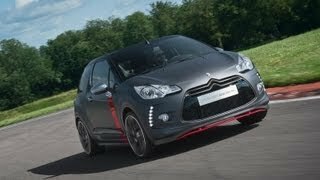 Citroen will be revealing the Citroen DS3 Cabrio Racing Concept at the Goodwood Festival of Speed this weekend and then in September at the 2013 Frankfurt Motor Show. 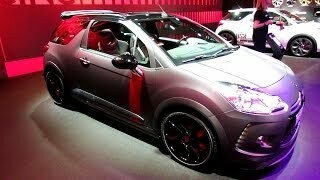 The Citroen concept car combines the best of the Citroen DS3 Racing with all the sophistication of the DS3 Cabrio. 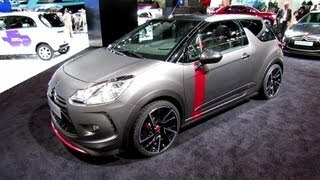 The Citroen DS3 Cabrio Racing Concept is offered in a Moondark matte textured grey paintwork allied with gloss black 19" wheels, and Black Chrome inserts on the handles, boot trim and door mirrors. The wheels are contrasted by the Carmin coloured brake calipers. It is powered by the turbocharged 1.6-liter THP engine producing 202 bhp (150 kW) maintaining the performance of the Racing version. 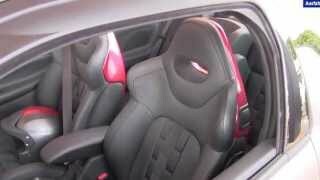 On the interior the Citroen DS3 Cabrio Racing Concept combines performance and elegance with bucket seats wrapped around in Nappa, leather and Alcantara. It comes with special DS pearl top-stitching, featured in Carmin. Carmin also appears on the seat housings and dashboard, echoing the door side strips.